Outdoor spaces are becoming natural extensions of our homes. We love creating places where families can relax after a long day at work and school or designing a prime spot for entertaining neighbors and friends. 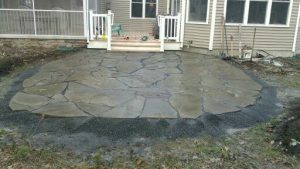 Roots can enhance your outdoor area with custom natural stonework features such as a patio, walkway, or decorative wall. Our stonework projects will enhance your existing landscape and blend with the exterior of your home, offering a seamless transition. We can integrate relaxing, landscaped water features such as fountains or ponds. Or, help extend the use of your outdoor living area with a fire pit. Contact us today to schedule an on-site consultation to discuss an outdoor stonework project or outdoor water feature.